It was one of the outgrowths of the Spanish Civil War that antitank guns of the 1930s were not able to knock out tanks of the 1930s, and therefore newer weapons were developed. The Czechs created one of the most powerful small antitank guns of the era in the Skoda Model 1936 47mm gun. Able to penetrate up to 51mm of armor protection, this was a very handy weapon and one gratefully taken over by the Germans in 1938. When the Pzkw. 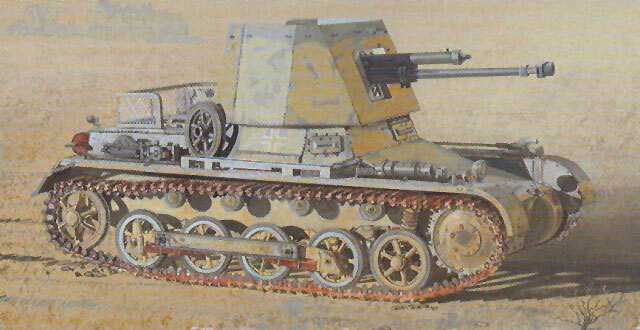 I was seen to be too weak to survive long even against the weak antitank guns of the early war period, a number of them were used as chassis to fit the Czech 47mm gun and turn into reasonably capable self-propelled antitank guns for use early in the war, and they gave good service in the deserts of North Africa. DML has now taken its nice little Pzkw. I Ausf. A kit and modified it to serve as the Ausf. B chassis for the Panzerjaeger I with the 4.7 cm Czech gun. As such, DML has only retained about 200 parts from the previous release and added more than 300 new ones to this kit. Some are old friends such as the generic German accessories sprues or infantry kit with helmets and canteens, but most are specific to this variant. As before the lower interior is relatively complete and includes internal bulkheads, controls, batteries, foot pedals, a brass radio mount, very complex but complete clear view ports and frames, and all hatches and ports on the upper side of the vehicle are optional position bits. While there is no engine, the kit now adds the ammo lockers for the 4.7 cm gun as well as separate rounds and other details. The tracks are again “Magic Track” links, which in this scale would be fine except for the fact that they are smaller than most 1/72 scale track links. This is one area where the use of DS plastic flexible track would probably have been more popular! The gun itself is amazing as it consists of at least 48 parts, including a one-piece muzzle brake that was created using “slide molding” techniques. The breech is positionable and other parts may be set as the modeler sees fit. Etched brass is limited to items such as the wheel rims (20) and the grilles and travel rack parts, so most of the rest of the parts are styrene, and in some cases very puny parts indeed. Care will have to be taken during assembly due to the size of some parts. Technical assistance was provided by Ed Kusiak, Tom Cockle and Gary Edmundson. Finishing instructions and decals are provided for five different vehicles: Pz.Jg.Abt. 605, North Africa 1942-1943 (worn sand over grey, white 35); Pz.Jg.Abt. Liebstandard Adolf Hitler, Eastern Front 1941 (grey with “wolf’s head” logo); Pz.Jg.Abt. Liebstandard Adolf Hitler, Eastern Front 1941(grey with SS divisional insignia); Pz.Jg.Abt. 643, Eastern Front 1942 (grey with worn whitewash, white Maltese cross); and 3./Pz.Jg.Abt. 605, Libya 1942 (sand with white 32). A targeted sheet of Cartograf decals is included. Overall, this is a good kit and one many modelers have sought for years. GA 64 German generic kit - helmets, canteens, gas masks, etc.